By Brian Walsh. Brian J. Walsh and J. Richard Middleton. Science, technology and economic growth motivate our socity. Each is carried on with a little regard for Christian concerns. Brian Walsh and Richard Middleton yearn for change. They long to see Christianity penetrate the structures of society, reforming and remolding our culturre. 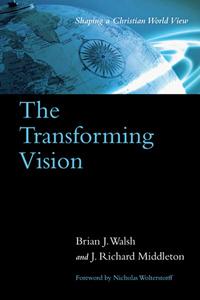 From scholarship in the universities to politics, business and family life, the Christian vision can transform our world. To stimulate such change the authors analyze our troubled age, show us how it got that way and suggest a solution. Their clear presentatioin of a Christian world view forms the basis of their hope.